CONVERT YOUR MIG WELDER TO A STANDARD EURO TORCH CONNECTOR WITH THIS COMPLETE KIT. TRAFIMET MB15 4MTR EURO TORCH. GAS SOLENOID, to replace the mechanical valve in original torch handle. FULL FITTING AND WIRING INSTRUCTIONS. (Also technical back up with 21 years experience in repairing welding equipment). THIS UNIVERSAL CONNECTOR CAN BE FITTED TO VARIOUS MACHINES ENABLING YOU TO FIT A STANDARD MIG TORCH WITH A EURO CONNECTOR. THE RESULT WILL BE A MUCH IMPROVED WIRE FEED. THE 4 MTR EURO TORCH ALSO HAS THE ADVANTAGE OF BEEN LONGER THAN MOST HOBBY MIG TORCHES, AND MORE ROBUST. THE TORCH USES STANDARD MB15 MIG TIPS AVAILABLE FOR 0.6MM, 0.8MM AND 1.0MM WIRES. THESE ARE AVAILABLE FROM ANY WELDING DISTRIBUTOR INCLUDING OURSELVES. IF YOU USE 0.6MM WIRE WE WOULD RECOMMEND ONE OF OUR EURO CONVERSION KITS WHICH INCLUDE A MB15 3MTR TORCH FOR BEST RESULTS. THE EURO CONNECTOR KIT COMPRISES OF A SOLID BRASS BLOCK, STEM, AND GUIDE TUBE, A PLASTIC FLANGE AND A 1 MTR LENGTH OF GAS HOSE. IT COMES WITH FULL INSTRUCTIONS ON HOW TO FIT INCLUDING WIRING THE 2 TRIGGER WIRES. 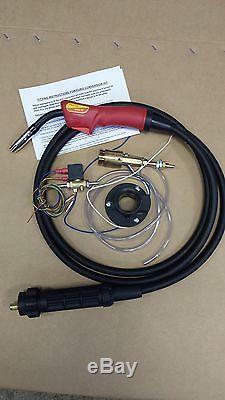 SOME WELDING MACHINES WILL REQUIRE A SOLENOID FITTING TO SWITCH THE GAS. THIS KIT INCLUDES A GAS SOLENOID AND COMES WITH FULL FITTING AND WIRING INSTRUCTIONS. Please view my other listings. This kit has been supplied to fit various makes and models of machines including: Clarke, SIP, Cebora, Snap-on, Lincoln, Migatronic, Telwyn, Sealey, Ferm, Erp, Maypole, Cosmos, Silverline, and many more. Please contact me for any technical help you require when choosing a euro torch kit. FOR MORE INFORMATION PLEASE SEND US A MESSAGE. VAT IS INCLUDED IN THE PRICE. PLEASE VIEW OUR OTHER ITEMS FOR SALE INCLUDING VARIOUS OTHER MIG AND TIG TORCHES, AND A UNIVERSAL WIRE FEED ASSEMBLY KIT, AND GAS SOLENOIDS. We have been designing, building and repairing all types of welding equipment in the UK for over 20 years. All new machines are built to a very high standard, using quality components and all comply with CE requirements. Conditions of return to base (RTB) warrenty are as follows: The machine will be repaired free of parts and labour for 3 months from the date of dispatch from our works. Tec arc will pay for return to the customer. There will be a charge if the fault or damage has been caused by mis-use by the purchaser or if no faults can be found with the machine. Because we design and manufacture welding machines, parts are kept in stocked, on our premises, and full technical back up is given if required. Any of our products can be demonstrated and collected at our premises. Any further information you require about us or any of our products please send us a message. Please contact me with your post code if you are not sure. The item "MIG EURO TORCH CONVERSION KIT INCLUDING MB15 4MTR TORCH AND GAS SOLENOID" is in sale since Tuesday, July 17, 2018. This item is in the category "Business, Office & Industrial\Metalworking/Milling/Welding\Welding & Soldering\Welding\Other Welding Equipment". The seller is "yorweldsupplies" and is located in YORK, North Yorkshire. This item can be shipped worldwide.